Work began late last week to replace old sewer lines in the City of Cedar Springs. This photo shows construction on E. Cherry Street. Post photo by J. Reed. 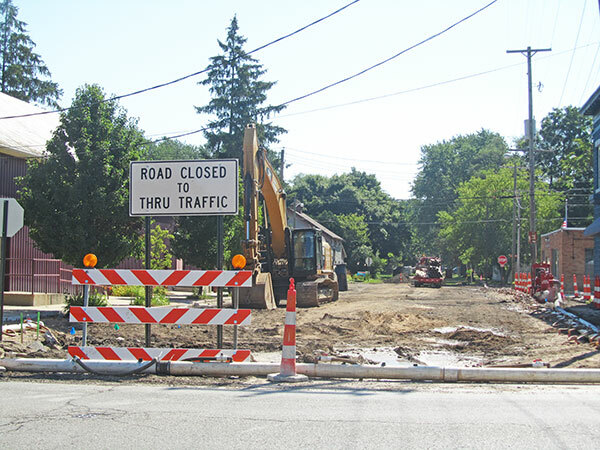 Area residents driving through the east side of the City of Cedar Springs probably couldn’t help but notice that the city’s utility reconstruction work has begun. The city is replacing antiquated sewer lines and will construct a new water main on Muskegon Street. Phase one of the project started with E. Cherry Street, and runs to just east of Park Street, and then south on Park to Ash Street. Asphalt was removed from those streets late last week, and work began in earnest this week on Cherry Street. Phases 1 and 2 will include removing the existing road surface, aggregate base and sub-base, and installing new sanitary sewer, storm sewer and water main and reconnection of sewer and water services. Phase 2 of the project will include reconstruction of Ash Street, from Park Street to Ann Street, Ann Street from Ash to Beech Street, and Linda Street from the Beech Street intersection. Phase 3 will be water main construction along Muskegon Street from Red Hawk Drive to the well fields. Phase 4 will include sanitary sewer lining and spot repairs around the city. The United States Post Office on Cherry Street is still open. You can access it by parking behind the Kent Theatre and walking across the street; parking in the alley behind the Post Office; or parking in their lot off First Street.